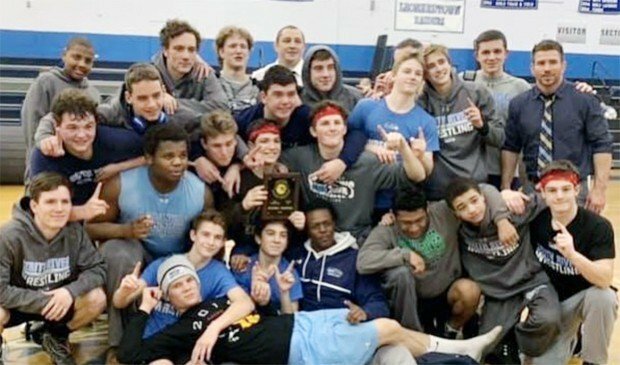 The South River wrestling team headed south to Leonardtown High School on Wednesday as the No. 20 team in the Maryland state dual meet rankings. They were set to face county rival Old Mill in the semifinals, then it was a likely clash with the No.12 host school for the championship. And that was how the script played out. The Seahawks got past the Patriots, 36-24, to setup the showdown with the Raiders, which they also won, 39-20. The match with Leonardtown was back and forth through two thirds of the meet. The action started at 113 with South River’s Nolan Lunsford drawing first blood with a 10-2 major decision of Brandon Oh. The Raiders’ No.5 Sean Vosburgh won a battle of state placers over No.12 Isaac Barber, 6-3, to spark the scoring for the home squad. Garrett Lee (No. 11 at 113) added a major-decision at 126 to grab the lead, 7-4. The teams split the next six matches with the Seahawks’ Joab Patino (132) registering an upset of Brian Bieshelt (No. 24 at 126), 8-7, along with wins by Justin Richards (145) and Riley Corkran (160). Leonardtown’s three victors in that stretch were, Finn Eskeland (138), No.6 Trevor Crowley (152), and No. 1 John Podsednik (170). Podsednik faced off with Trenton Puccinelli (No. 5 at 160) in a high caliber matchup that saw Puccinelli keep the state champion to just a regular decision, 10-4. With score sitting 20-16 in favor of the hosts, things took a downward turn for them as South River rattled off five straight wins to close the dual and the win. Sam Hicks (182) and No. 21 Alex Peterson put threes on the board. Nico Nolte (195) and No.4 Ka’Ron Lewis, the defending 4A/3A heavyweight state champion, stuck their opponents. No. 13 Mason Smith (106) closed the victory with a tech-fall of Matthew Oh. There would be no such winning streak to put the match away with Old Mill in the semi-finals. Instead, this match was like a wave, with each team sharing the lead. Bonus points were the story of this match…South River got ‘em, Old Mill did not (they each won seven matches). The wave started in the Seahawks’s favor with two pins and a decision to go up 15-0. Mason Smith and Nolan Lunsford were responsible for the falls, Isaac Barber had to fight for his 1-0 win over No. 13 Ryheam Tull. Old Mill roared back with five straight wins, but the lack of bonus points left them with just a three-point lead, 18-15, despite the impressive run. Three major-decisions were put in the book by Damion Mansapit (126), Jackson Cohenour (132), and Caron Tull (152). Eric Smart (138) added a 3-2 win over Joab Patino and Brent Newland posted a shutout of Justin Richards, 4-0, at 145. Riley Corkran picked up a pin at 160, that coupled with Trenton Puccinelli’s forfeit at 170 pushed South River out to a 27-18 lead. Nehemiah Carter (182) and No. 21 Levi Garren (195) got the Patriots back in the win column, but again, the bonus points eluded them as a 6-5 and 3-0 decision were rung up respectively. Two bouts remained with the Seahawks holding a 27-24 lead, and two of their senior leaders came through with big wins. Alex Peterson (220) won a tight one over No. 24 Nate Fleming, 2-1. Heavyweight Ka’Ron Lewis closed the door when he pinned Stephen Nisweiner to secure the 36-24 win. Leonardtown beat North County in the other semifinal. The Seahawks travel back to Southern Maryland this Saturday to take part in the MPSSAA State Dual Meet Championships at North Point High School in Waldorf. They will occupy the two seed and face the South Champ, Eleanor Roosevelt. The other semi-final pits No.11 Springbrook, the North winner, against its county rival Bethesda-Chevy Chase (West). The 4A semifinals are scheduled for 2:00 p.m. with the finals to follow at 6:30 p.m.